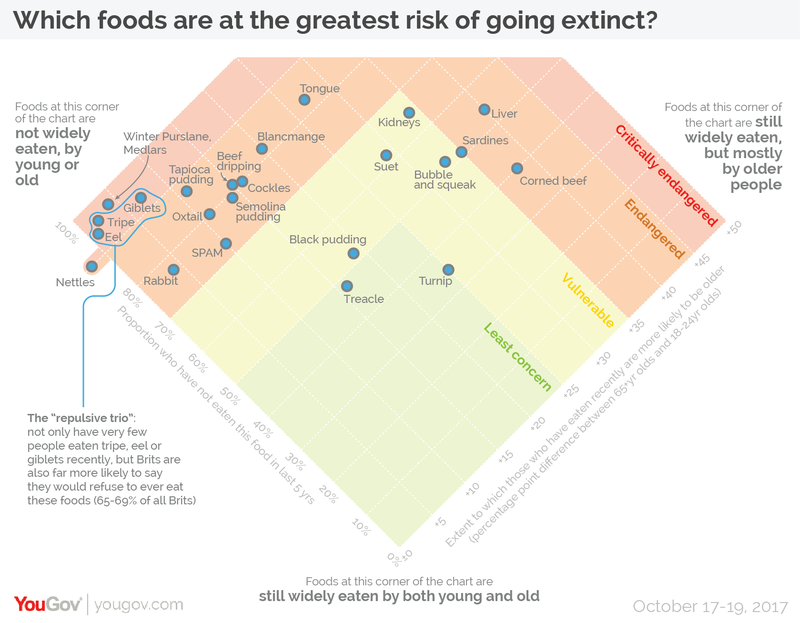 Which traditional British foods are at greatest risk of extinction? July 05, 2018, 11:00 p.m.
Last year the BBC asked whether Britain could ever fall in love with tripe again, but a new YouGov Omnibus survey reveals that tripe is one of the traditional British foods that is most at risk of extinction. In order to determine the conservation status of potentially at-risk British foods, we chose 24 foods that tend to be associated with olden days and asked Brits whether they had ever eaten each of those foods. A follow-up question was asked depending on their answer: those who had ever eaten a specific food were asked whether they had done so in the last five years; those who had not eaten a food were asked whether or not they would be willing to do so. Combining the results of these answers together reveals three foods in particular appear to be highly at risk of extinction. For what we have dubbed “the repulsive trio” – tripe, giblets and eel – not only have few people eaten them recently (4%, 7% and 6%, respectively) but two thirds of Brits say they would not be willing to even give them a try. 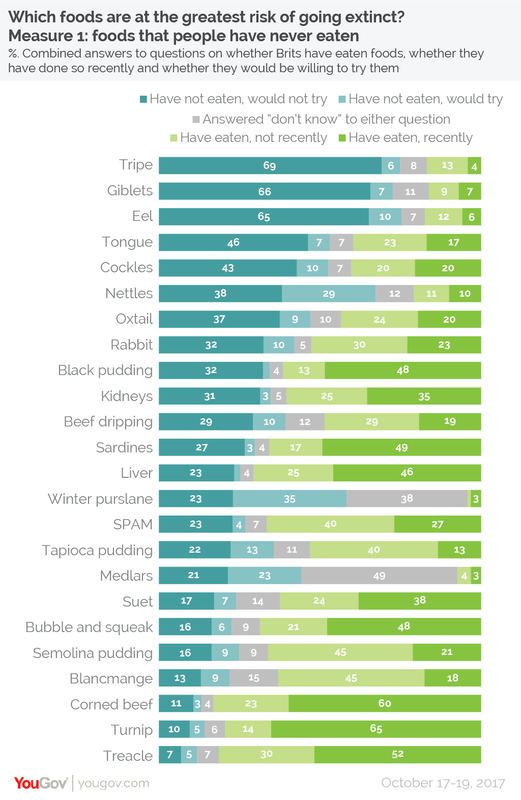 These three sit far ahead of their closest rivals – tongue and cockles, which 46% and 43% of Brits respectively have never eaten and would be unwilling to try. 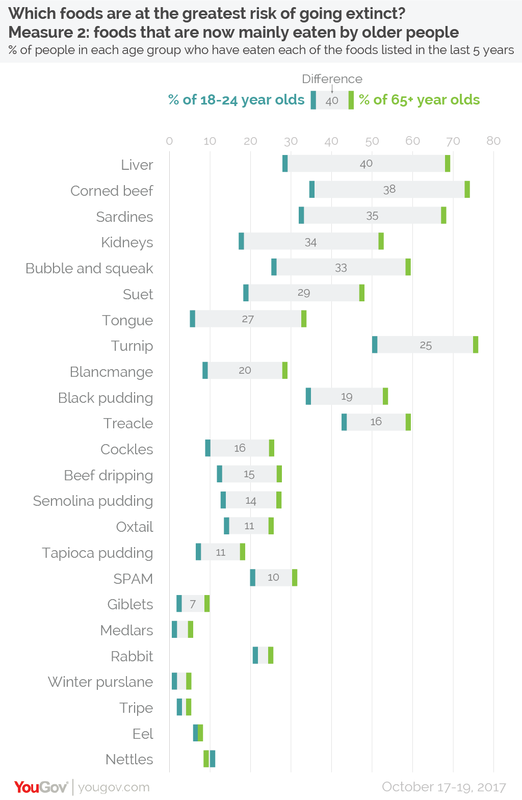 By contrast, foods that large numbers of people still seem to be eating include turnips (65%), corned beef (60%), treacle (52%), sardines (49%), black pudding (48%) and bubble and squeak (also 48%). Which foods are now only eaten by old people? However, this measure is not enough in and of itself. While some foods may appear to be widely consumed, this is because they are mostly only eaten by older Brits (who are more numerous than their younger peers). Therefore another measure of whether or not a food is at risk of going extinct must be whether they are still widely eaten across the generations, or if they will die out once older Brits pass on. The food that is most at risk of going extinct under this measure is liver: while 46% of Brits have eaten liver recently, only 29% of 18-24 year olds have done so compared to more than two thirds (69%) of those aged 65 and older. Similarly at-risk foods include corned beef (35% of 18-24 year olds compared to 73% of 65+ year olds), sardines (33% vs 68%) and kidneys (18% vs 52%). It is notable here that there is very little difference between young and old when it comes to the repulsive trio – this is simply because so few people of any age eat them. Combining the two measures provides us with a clear view of which foods are at greatest risk of extinction. The foods in the most at-risk category – Critically Endangered – include the repulsive trio of tripe, giblets and eel, as well as winter purslane and medlars. Nettles are also on the cusp of this status. Most of the foods occupy the next category – Endangered. This includes tapioca pudding, blancmange and tongue, which few people still eat, while liver, corned beef and sardines fall into this category due to the fact that they are primarily only eaten by older people. Foods that are less at risk, falling into the Vulnerable category, are black pudding, kidneys, bubble and squeak and suet, while only two foods fall into our category of Least Concern: turnip and treacle.